Jeep Wrangler Sport: Starting at $26,995 MSRP. The entry-level Jeep Wrangler Sport features many of the standard features found in its big brothers, including adjustable bucket seats, air conditioning, multifunction steering wheel, in-dash touchscreen audio display, integrated voice command with Bluetooth, and much more. Jeep Wrangler Sport S: Starting at $30,195 MSRP. The Sport S is equipped with a standard black Sunrider Soft Top or fair-weather convertibility, as well as conveniences like automatic headlamps, power heated exterior mirrors, rear cargo tie-down loops, full-length floor console, 12v auxiliary power outlets, and more. Jeep Wrangler Rubicon: Starting at $36,995 MSRP. The 2- or 4-door Rubicon is powered by the 3.6 L V6 engine delivering 285-hp and 260 lb.-ft. of torque, and features a standard engine oil cooler and 3rd generation Dana 44 HD wide front and rear axles for off-road superiority. Jeep Wrangler Sahara: Starting at $37,345 MSRP. The Sahara 4-door offers Hobbs drivers a more refined cabin with standard Uconnect 4 with 8-speaker audio system, Apple CarPlay and Android Auto capability, reclining front seats, 60/40 folding rear seat with expandable cargo area, and more. 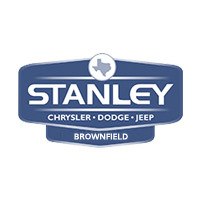 Explore the possibilities and upgrade your next Lubbock trip with a new Jeep Wrangler from Stanley CDJR. Contact us online or by phone at (888) 311-1268 to get started.